Denon introduces 800NE hi-fi series, CEOL N10 network system, new turntables... | What Hi-Fi? ...and the rest! Denon's engineers have been really rather busy. Denon has pulled the covers off several new hi-fi products for 2018, including a three-strong 800 hi-fi component series, a fourth-generation model of its CEOL network music system, its first turntables in over a decade and a £269 speaker-inclusive microsystem. 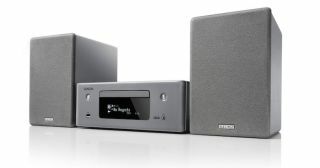 Replacing the brand’s 700 series, Denon’s 800NE range comprises the DNP-800NE network streamer (£449, due in September), DCD 800NE CD player (£349, due in August) and the PMA 800NE amplifier (£449, also due in August). The DNP-800NE is based on Denon’s HEOS wireless, multi-room music platform, giving users access to local and networked music streaming and multiple streaming services. AirPlay 2 is coming in August, and Bluetooth provides offline streaming. The DNP-800NE has a variable output (in addition to a fixed variant), allowing the volume of a system not including a Denon amplifier to be controlled via the HEOS app. The DCD 800NE CD player doesn’t just cater for disc-playing, but also has a DAC at the end of optical, coaxial and USB inputs for connecting additional digital sources - it can handle playback of PCM files up to 32bit/192kHz and DSD 5.6MHZ. The range’s 85-watt-per-channel PMA 800NE stereo amp also offers digital connectivity, with three optical and a single coax input joining four analogue RCA and a MM/MC phono input. Denon first introduced its CEOL (N-7) network music system in 2010, and, eight years on, we have the latest (fourth) generation model, the N10. Like the DNP-800NE, the N10 also built on the HEOS streaming platform. But not content with offering a vast assortment of hi-res network streaming options, it also offers Bluetooth, Spotify Connect, Internet radio, optical inputs, FM/AM radio and a built-in CD player. It will also get the AirPlay 2 update in August. Amazon Alexa support means the CEOL can be turned on/off and controlled simply with your voice, and it is able to wirelessly stream its CD or tuner playback to other HEOS devices. Aesthetics have also been revised. The CEOL N10 has an improved OLED display and a glossier, more scratch-resistant acrylic top panel. There’s now also a grey finish in addition to white and black options. The CEOL N10 is priced £449, or £549 with a pair of speakers (which have also seen improvements over the pair bundled with the last-gen CEOL). We’re pleased to hear that the beloved (and Award-winning, no less) D-M41DAB microsystem continues for another year. It is to be joined this year by an even more affordable microsystem, the DT-1, which on paper looks like a bargain for its humble £269 price tag. A built-in slot-loading CD player is joined on the spec sheet by FM/AM radio, Bluetooth, and aux and optical inputs. There’s also alarm functions and a headphone output, and the unit comes with a pair of speakers. The DT-1 will be available in October in a choice of black or grey finishes. Denon engineers have also been busy working on two new turntables for this year. Because why wouldn't they? The DP-400 (£449) and DP-450USB (£529) – due in September – are the first Denon turntables in over a decade. The only difference between the two is the latter’s ability to rip vinyl as digital files. In terms of turntable design, they are identical. Denon has used its original S-Shape tonearm design, a MM cartridge, and removable AC and audio cables. They also have built-in phono stages so they can be hooked straight up to a system, and both feature unique dust covers that can be removed and used to rest a vinyl album sleeve against. And another function that might appeal to a modern vinyl user: a lifter that automatically returns the tonearm to its cradle when it detects that the record has ended.